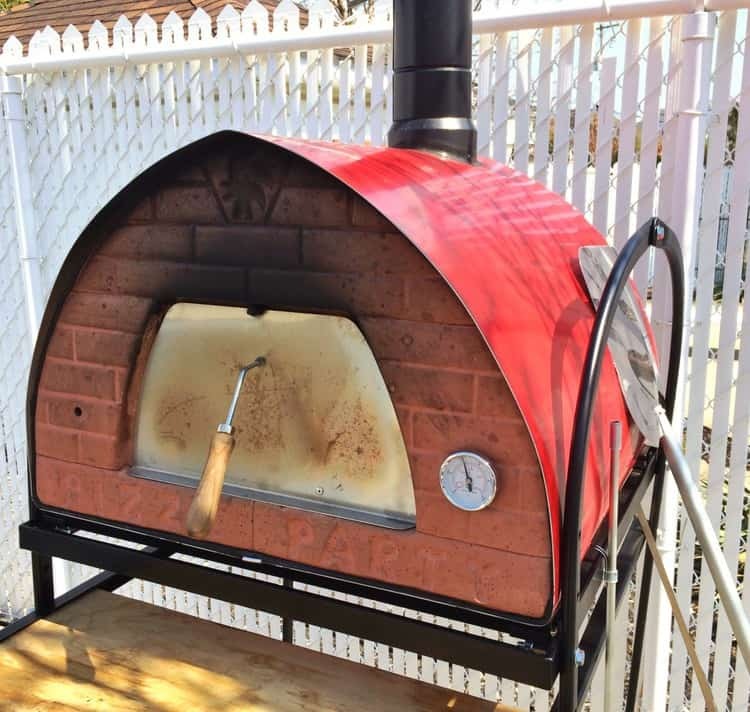 Making pizza has never been better since we purchased our wood burning pizza oven. It has become a family affair! 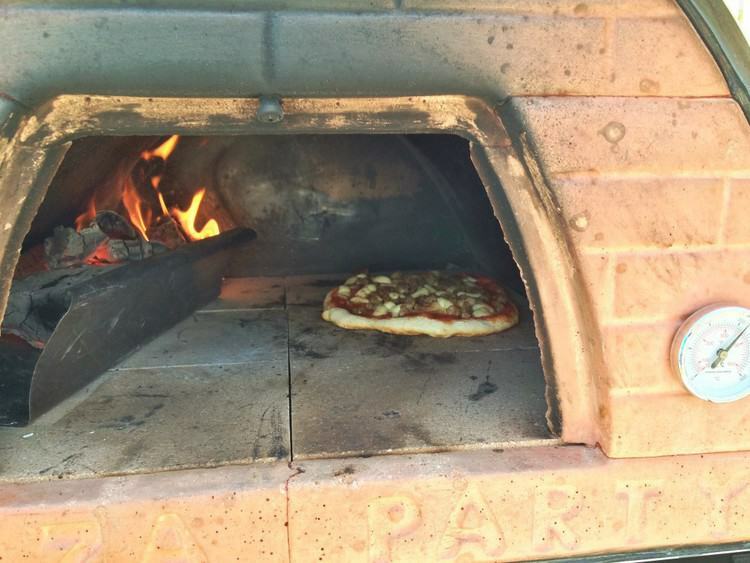 Two years ago we asked our son what he wanted for his birthday and he chose a wood burning pizza oven! Not a typical choice for a twelve year old, is it? We’ve come a long way when I think back to when he was an underweight baby who refused to eat. I shed many tears worried that my baby was malnourished. But alas, things change. 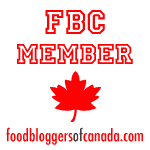 He discovered a passion for eating at the age of six or seven and the rest is history. While my husband and I first thought this was an outrageous birthday request, we were enticed by the idea of baking our own pizzas, bread and other goodies in our backyard. It didn’t take long to convince us. We told our son that if we made this purchase he would have to participate in making the pizza and not sit around waiting for us to feed him. He agreed and indeed he rolled up his sleeves and began kneading pizza dough. Soon after we purchased a Kitchen Aid mixer to help with the task. After all if we were going to be making dough on a regular basis it would be worth the extra expense! In reality, the whole family is involved, each of us taking care of our stations on pizza making days. I’ll take care of the dough most of the time, the children take care of toppings, my husband mans the fire and the children go back and forth bringing the pizzas from the kitchen to the oven. I love it when cooking brings our family together! I still remember taking my first bite of our pizzas two summers ago, giddy with excitement. Nothing beats that woodsy, smoky flavor. Now almost every summer weekend, weather cooperating, is pizza making time. We soon began to experiment with other meals: roast chicken; osso buco; apple crisp; and we even roasted the Thanksgiving turkey last year. Unfortunately, with our climate, the pizza oven hibernates in our garage for almost six months a year. Thankfully, it emerged from the garage last week and we set out to prepare our first pizzas of the season with much enthusiasm. 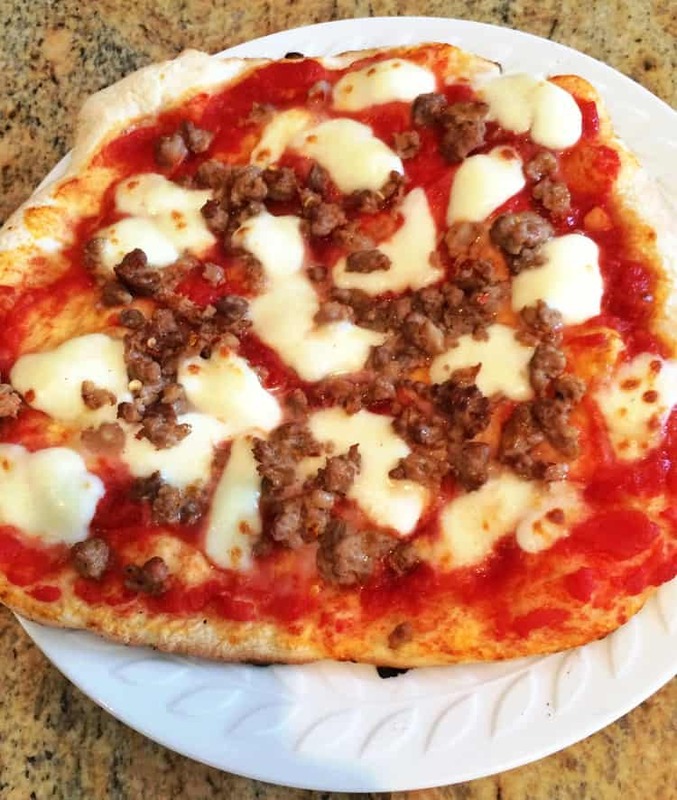 This pizza dough recipe makes 6 -10 inch pizzas. We are enjoying experimenting with different toppings and fillings. My son’s suggestion was a rotolo he had seen on television, as seen below. 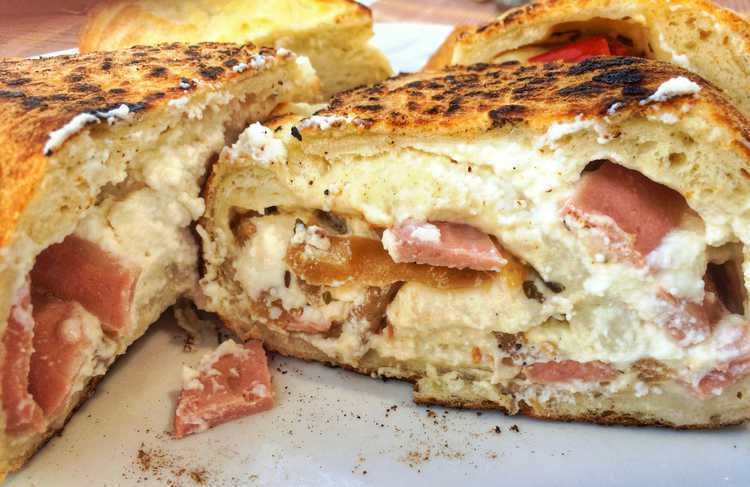 He covered his dough with chopped mortadella, marinated spicy eggplant and dollops of ricotta. The dough is rolled up lengthwise and sliced after baking. Delicious! 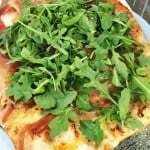 In the recipe below, I listed our favorite pizza topping ingredients but without specific measurements as they can vary according to your taste and the number of pizzas you decide to prepare. 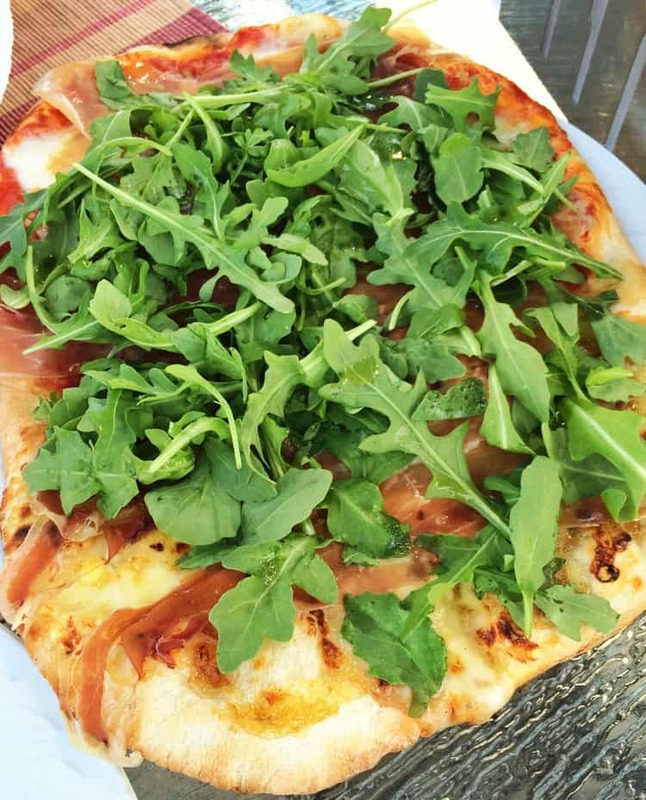 My personal favourite remains the arugula prosciutto pizza shown at the top of this post.. We bake the dough with only tomato sauce and mozzarella and cover it with prosciutto slices and fresh arugula when it comes out of the oven. And of course, don’t forget to set aside one dough for a dessert pizza slathered in chocolate hazelnut spread and topped with bananas! Baking the pizzas in the word burning oven is incredibly fast. With a temperature of 750ºC, the pizzas are ready in about 2-3 minutes. As you can tell from my photo, the interior is not very big and could fit 2 individual size pizzas but we prefer to bake them one at a time. I have to be totally honest with you, we say that this pizza oven was my son’s birthday gift, but it’s turned out to be a gift for the entire family. Here’s looking forward to a long summer of pizza baking! Transfer dough to a large bowl lightly coated with olive oil and turn it once to coat with oil. Cover with a clean cloth and let rise in a warm place until doubled in bulk, about 1 1/2 hours. Preheat oven to 475ºF. Dust 3 baking sheets with cornmeal. You can fit 2 pizzas on each sheet. Alternately, place a baking stone in the oven and preheat for 45 minutes. If using a wood burning oven, heat the oven to 750ºC. Punch down the dough and divide in 6 pieces. Roll each piece into a ball and let rest, covered with a cloth, for 15 minutes. Using your fingers or a rolling pin, flatten each ball of dough into roughly a 10 inch round on a lightly floured surface. Place 2 pizzas per baking sheet (or baker's peel if using a pizza stone). Use your fingertips to push dents in the surface of the dough, to prevent bubbling and let rest for about 10 minutes. The pizza is now ready to be topped and baked. Add desired toppings. If using baking sheets, place on bottom rack. You will be able to bake 2 at a time. If using a pizza stone, slide the pizza off the peel onto the baking stone. Bake until the crust is browned and cheese is golden and bubbling, about 12 minutes. If using a word burning oven, when the oven has reached 750ºC , slide the pizza in the centre of the oven with the pizza peel and bake for about 2-3 minutes, rotating it in order to evenly bake all sides.